and I’m not pregnant. That’s all for now. Did another HPT this morning with fmu and got the exact same results as yesterday. No darker, no lighter. I watched the damn thing for the entire 10 minutes after I peed on it. It looks exactly like the one in yesterday’s photo. But my temp is way down this morning. Seeing that makes it hard to remain hopeful. You’re supposed to wait until you’re a week late for reason I suppose. Anyway, too tired of the hoping/guessing. Got to give myself a reality check and just wait a little longer without getting my hopes up. Thanks for all the support folks. I got the pink kind this time. Was gonna wait until tomorrow morning since I already did one this morning, but we all know how good I am at waiting. See the line on the left? Or is it just me? Do the pink ones not get evaporation lines at all? Or just not as obviously? Anyway, what do you think? If AF is coming, she’s probably making her appearance today, but my temps are still way up. I would be very surprised if she did show up. Also, she usually shows up first thing in the morning with a BM. I did have a BM, which I was totally scared to do for fear she would show up, but she didn’t. 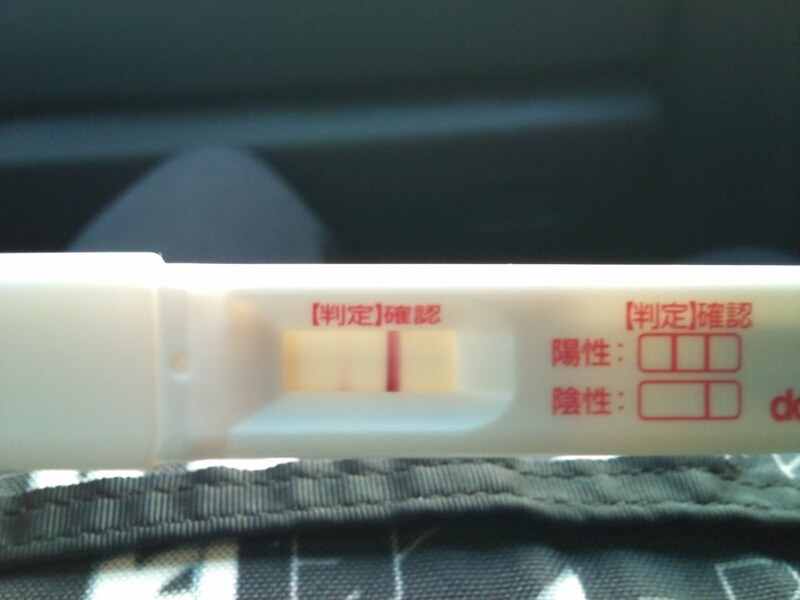 Took another HPT, and the same result, only a very faint, possibly not even there, line. I am seriously going nuts at this point. I’ve been charting using Fertility Friend.com though, and according to my chart, FF thinks that I may have implanted 12 DPO (days post ovulation). That would account for the negative/faint HPTs until now. BUT there all these studies that show that implanting after 10dpo leaves you with a really high chance of miscarriage. Ok, I guess I’m still waiting. Hopefully I’ll have some kind of (happy) update soon! No AF and no conclusive HPT. Still waiting. Maybe tomorrow I’ll have an answer. In other news, yesterday Akinori’s sister announced that she is pregnant again. I’d love to expand on how I am feeling about all this at the moment, but I have a 5p.m. deadline, and it’s 2p.m. Gotta prioritize.